(Bloomberg) -- Cement producers in the Arab world’s biggest economy could be in for another year of low profits as major construction work announced by the government proves slow to get off the ground. 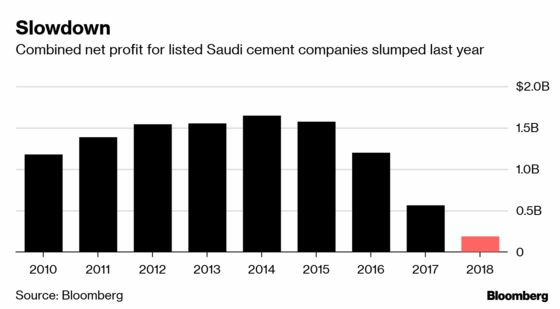 Combined net income for 15 listed cement companies in Saudi Arabia was $185.7 million last year, almost 90 percent lower than the $1.6 billion posted as recently as 2014, according to data compiled by Bloomberg. There are few clear indications of an improvement this year, according to analysts. The sector is bedeviled by weak demand and increased competition, especially among producers based in western and central Saudi Arabia. A reduction in energy subsidies has added to their woes by raising transportation costs. Saudi Arabia has announced initiatives such as the $500 billion futuristic Neom city and The Red Sea Project to attract foreign investment and bolster non-oil revenue. Critics have questioned the mega-developments after previous efforts to construct industrial and financial cities struggled to take off. Saudi Cement Co., based in the eastern petroleum hub of Dammam, recorded the largest net income among the 15 listed companies last year at about $107 million, down from the $121 million generated a year earlier. On the other hand, Tabuk Cement Co., located in the north-west of the country, was at the opposite end of the scale, with a loss of $26 million, more than four times wider than its loss in 2017. Saudi Cement rose 0.5 percent in Riyadh on Monday, extending its gains in the past year to 13 percent. Tabuk finished unchanged, and is down 13 percent in the past 12 months.